Since the weather has been so obliging, with warm, sunny days and plenty of rain, I’ve had to do very little this season. 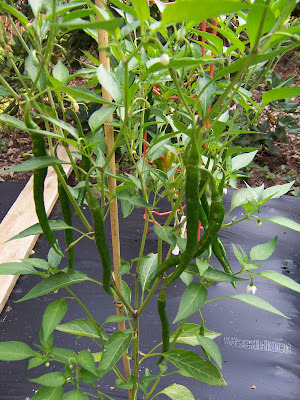 Everything is growing like gangbusters, from the kung pao peppers (pictured here) to the potatoes and tomatoes. The only disappointment is the cilantro, which wants to do nothing but bolt to seed. I keep pinching off the blooms, but it remains leggy and obstinate. I am also constantly pulling up “volunteer” tomato plants. There must have been a lot of tomato seeds in the soil when we tilled it this spring, since baby plants keep popping up in the oddest places. A few that came up along the fence line have been left as an experiment – if we have a warm spell in the fall they may produce yet. I also had a volunteer melon plant come up. 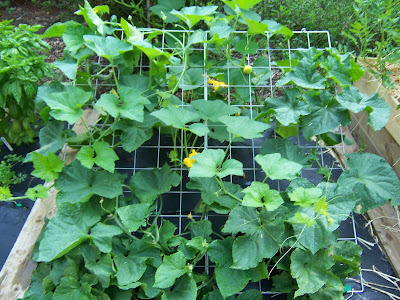 Fortuitously, it appeared at the back edge of the garden, behind the cucumber trellis, where it could get some support. I’m training it along the fence line and up over the trellis, so right now it and the two Fanfare cuke plants are jockeying for position on the trellis. That little round yellow and green thing just to the upper right of center is a baby melon. I’ve harvested over a dozen cukes in the past week; I had so many that I took a bunch to the Liberty Smith workshop (my current project, for Ford’s Theater), where the team snapped them up. The Super Marzano tomatoes are currently over five feet tall and the toms themselves are just beginning to ripen (I had my first small tomato in a salad last week). There are plenty of baby tomatoes on the Sweet 100s plant; not so many on the Brandywines but one of the green fruits is looking like it’s going to be quite large. The bean patch is a flurry of activity as well. 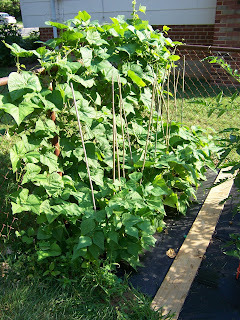 The green beans are twining madly up and along the fence line. They just started blooming about five days ago so no beans yet, but the yellow wax beans (the shorter plants with the bamboo stake supports) are producing like crazy. I’ve got about two quarts of them to cook up; I’m waiting for tomorrow, when I will have an evening off from Liberty Smith. My potatoes are looking well. 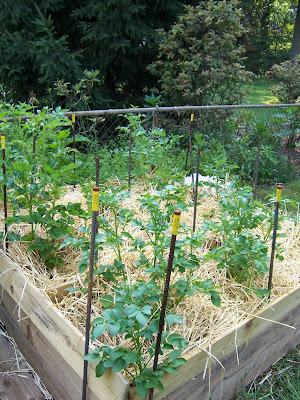 The largest of the plants is hip-high and I think I’m going to have to buy another set of planks to build the potato boxes up one more level (I’m pretty proud of my picket-and-rebar box construction – I wanted something I could put together and take apart easily, so I came up with the design last year). I’m using straw this year to hill up the plants and it seems to be working and is certainly a lot easier to deal with than a comparable amount of soil. Last year’s crop was disappointing and the year before that I did everything wrong, but I think I may I finally sorted out how to “do” potatoes. Of course, I won’t know for sure until I harvest in the fall, but I’m feeling pretty hopeful right now. 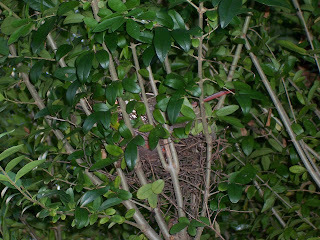 A couple of weeks ago I noticed a partial bird’s nest just above eye level in the bushes near my potting bench, which is opposite the vegetable garden. I thought it was just an abandoned attempt and didn’t pay it much attention. Last week my nieces Jillian and Quinn were visiting, so I thought I’d show them the nest; I pulled down on the branch the nest was sitting in, and was startled when a female cardinal erupted out of it. Later on, when the nest wasn’t occupied, my brother-in-law James lifted Jillian up so she could look into it, and she reported that there were two small speckled eggs inside. I felt bad because I can’t avoid getting close to the nest on occasion; the outside spigot is right next to the bush, and of course I’m in the garden and at the potting bench a lot during the summer. I don’t want to disturb the birds and make them abandon their nest. However, Mrs. Cardinal has been sitting tight – that reddish horizontal thing at the right center of the picture is her tail. I’m looking forward to watching her raise her babies while I tend to mine.